Is an age gap in marriage a problem? When considering marriage: Is an age gap (10-15 years) a bad idea (specifically for a girl being the younger)? You have probably heard that a physician shouldn’t treat members of his own family and that a lawyer must recuse herself from cases that strike too close to home. On that basis, we admit up front that we are not objective observers on this question since a bit more than ten years separates the two of us. It is with that awareness of some potential bias that we approach your question. There is a big difference between factors that imperil a relationship and those factors that can complicate a relationship but which can be overcome. For example, if two people have different religions, then no matter how compatible they are on other issues, we would heartily warn them against marriage. We’d warn against marriage if they are committed to different value systems, which in today’s climate might be revealed by different political preferences. These kinds of differences will become bigger problem as years go by, not smaller. On the other hand, when two people come from different economic backgrounds, ethnic groups, countries, social strata, emotionally different homes or a host of other factors, they can have a wonderfully successful marriage. However, it is prudent to be aware of potential issues. When it comes to age, what are these issues? The positive side of marrying a man who is older by a number of years is that a woman has a better idea of who he is. He has had time to establish a track record in terms of community involvement, job success and personal behavior. There is more clarity about who he is than when the future is only speculation. His ability to have already put away a few dollars can help a couple start off on a more secure economic footing. What issues should be addressed? Other than wanting to listen to music from different decades on long car rides ((Now we may be getting a bit personal-RDL), which is minor in the scheme of things, there are questions worth asking. Does the man respect the woman or is his attitude towards her more paternalistic in nature? Is she looking for a spouse, partner and head of household or for a father figure? Are there any major issues concerning how the two may have been raised with decidedly different attitudes as times changed—the world is moving faster than it used to. We are less sanguine about an age difference when the woman is older. For a variety of reasons, marital stability is more likely to be imperiled with a noticeable age gap in favor of the woman. The bottom line is that there are many issues that should be discussed as a couple contemplates marriage. How those discussions go and how conflicts are resolved is more important than a gap of ten or fifteen years. May whatever decision you make put you on the path to a bright future. Too often, in our culture, too much emphasis is placed upon the wedding (Say Yes to the Dress, 4 Weddings are such ‘reality’ TV programs) rather than the Marriage. My grandparents married in the 1930s – he 21, she 15….They had their problems and there was nothing ‘perfect’ about their marriage EXCEPT..they ‘feared the Lord” so they really meant ’til death do us part’. They celebrated 60 yrs before death separated them. Because they “feared the Lord”, they really meant the “til death do us part” so they worked HARD to make sure that was the case. Wedding and Marriage are not the same thing. Somehow, we, as a society, no longer can tell the difference. I don’t think I can even count the number of times we have counseled young couples to stress less about the six hours of their wedding and focus more on decades of married life. so often couples (and let’s be frank here, more often it’s the bride rather than the groom who is stressing and causing stress. The guy usually has negligible interest in the actual wedding) drive themselves (and everyone around them) crazy with wedding details and nuptial emotion. As you say, it’s all about the character to make a commitment and the strength to keep it. I was very distressed when my daughter announced she was going to marry a man ten years her senior. As it turned out I could not have picked a better soninlaw if we still in the era when fathers arranged for there children’s marriages. So I say to Rebbeca. Go for it. That kind of age difference does have problems especially towards the end of the life of the elder person. Mum was still only 45 when Dad died of cancer aged near 80. 30+ years of age difference needs to be considered and I personally doubt whether a 20 year-old is wise enough to evaluate what strains may occur. I repeat, that they were very happy and it was a good environment to grow up in. but…. You’re point is well taken, John. While health is often unpredictable, where there is a large gap it should be taken into account. If a man 30 years older than my daughter wished to become my son-in-law, I would probably try to discourage the match for both their sakes. If he was ten years younger than my daughter I would try to discourage it just as vigorously. But parents are not always right. Much of the time they do know better than their children, particularly younger children. But in marriage it is not so easy. For this reason, ancient Jewish wisdom frees the child from the obligation of obedience to parents if the parents try to push a particular match. Would you expound on the “perils” please? Hi Susan. The reason we left it at that statement is because it would take more than a few words to answer. Perhaps it can be another complete Ask the Rabbi – though my guess is that we would get more pushback on that one. My husband did discuss one related reason here: https://rabbidaniellapin.com/never-marry-your-aunt/. While not on the specific topic of an age gap, one can extrapolate from it. That explains a lot. Thank you. 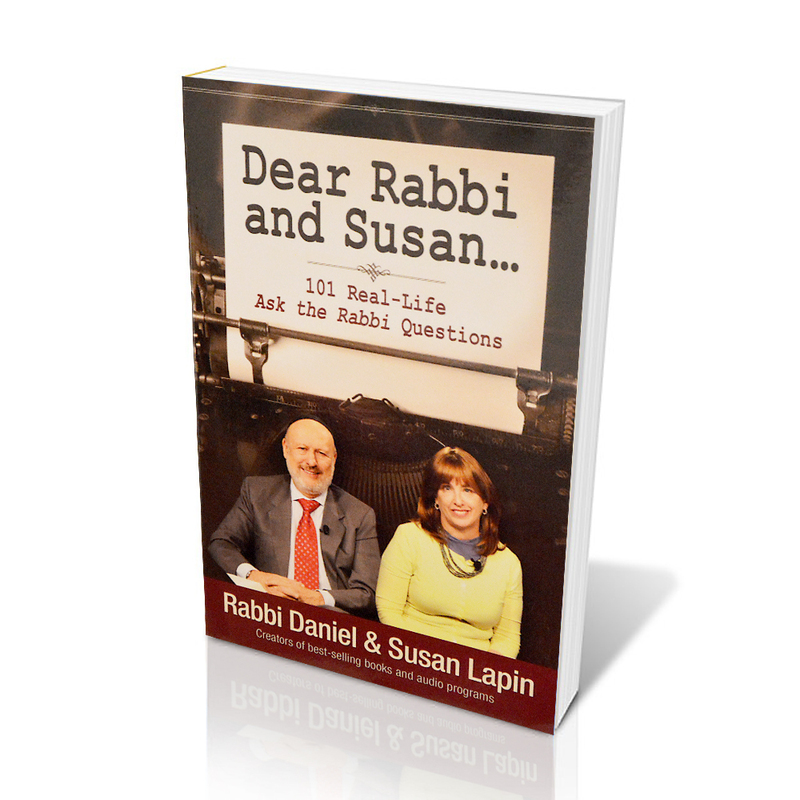 Susan Lapin already responded so very well, I have little to add but I will say that we added that piece to the answer in the interests of providing as full an answer as possible but knowing it would inevitably tweek the curiosity of many readers. I am sorry we felt that we couldn’t answer it fully in the context of a comment page. But please take a look at the letter from Dianne Liba Hart on this page to see that older woman/younger man marriages are of course not doomed. It just means that they can demand a little more work and commitment. I am sure someone has already compiled a ‘score sheet’ of compatibility issues that pretend to predict the durability of a marriage with a way of assigning numerical values to each factor. For instance, different religion-deduct 4; man with financial stress-deduct 6; man older than woman by 1-5 years-add 3; woman older than man by 1-5 years-deduct 2; for each sexual partner before marriage-deduct 2; etc, etc. By the way, though I am sure it has been done, I’ve not seen it and would have little faith in its actual ability to predict anything. We are not chimpanzees, we are children of God capable of growth, struggle, and triumph in utterly unpredictable ways. 12 years difference between my wife and I – and 3 kids – from her previous marriage. Its a definite struggle considering we didn’t get married until I was 54. I never realized how 16 years as a bachelor makes me so stubborn in my ways. But I will adapt because its not a wedding – its a marriage and its got to work. That is certainly the right attitude, Frank. but I’m equally sure that your family brings you joys you’d never have known had you continued your long bachelor status. Sounds to me like both you and your wife are happy and grateful that you met and married. Dear Miss Susan: A story of two marriages- One is a handsome young man just out of medical school and residency and a beautiful young lady ten years his junior. THey had known each other for years since meeting when she was in nursing school and he was in medical school. He went to serve his country and when he got home, finished his residency in radiology, they married. He went on to become a very well respected member of his profession, She became a stay at home wife who raised successful children, joined and be apart of many civic organisations, went to school when her children left the nest to become a paralegal, a realtor, taught herself many skills and crafts and was generally happy. They had a successful, satisfying and enjoyable marriage that lasted until the husband died after nearly fifty years. They were happy and successful because she did not fall into the trap of being just a housewife who did not keep up with her husband. She stayed interesting and could discuss any subject intelligently, could represent him in society and at social events and could listen and to him and provide support and advice, to him personally and professionally. When he passed on, she collapsed and in a few years developed severe dementia and passed on also. Because of of their great love for one another, they could not exist apart from one another, although each was successful in individually. Age was not a factor. These were my beloved parents. The second couple married young. They were within a few months of the same age. He worked, went to professional school at night while working full time while she raised the children until they were old enough to go to school and then she went to work as office manager for a medical practice from which she has recently retired. She was very successful herself, becoming the president of several professional organisations, which greatly benefitted her employer due to the respect she was held by others in her profession. The young husband opened a law office, struggled to make ends meet for several years, but became a respected member of his profession. He and his wife, although they did not always agree on things respected the other and could talk easily. The children grew up to be successful professionals and married wise and intelligent women who also have demanding jobs, one as a computer engineer and the other as a teacher. Both are growing in their professions. The point is the age difference at marriage is not the a real factor in a successful marriage. The ability of each party to grow, to not become stagnant, to be interesting and respectful of the other is much more important. To hazard a guess though,, Rebekah (Rebecca) has second thoughts about the marriage in general and is using the age difference as a proxy for other questions she is pondering. This is good. she needs to satisfy herself that the husband to be is someone she can live with , and grow with, and love, through good times and bad, wealth and poverty, better or worse, illness or health, and finally life or death. It is good, if I do not sound too boasting, to look back on a life with a wonderful woman, especially one of those extraordinary women named Susan, and realize it gets better and better. We are together unto the end whether the seas are smooth or rough. We can reef the sails if we have too, but we will make the journey intack. Fair winds to you and your blessed husband. We knew we could count on you for a great story, Bill. And you gave us two! First I have to say that I did spend a lot of time projecting into the future before I said yes to marriage. My husband is 7 years younger than me and of a different faith. He is also kind, open-minded, strong & financially capable so that as we approach our 31st anniversary in April I feel we made good choices. We raised our children Jewish, (my religion) and are happy that both of them are financially stable, well-educated & doing a good job of raising our grandchildren. I have 3 female friends who have younger husbands (more than 6 years & one more than ten years.) These relationships are also doing well. I will add that we were not youngsters when we wed. So I guess I am saying each case must be approached with wisdom & prayer. Thank you so much for all the time & thought you give to the people looking to you for answers. Thank you for your perspective, Dianna. As human beings, there are general rules but each of us is a unique individual and has to make choices and take responsibility for ourselves. How lovely to hear happy stories; thanks so much. Of course, as you say, age disparity is only one aspect of overall compatibility and commitment and not necessarily the most important but in answering the question put to us, it was one aspect to be considered. If you don’t mind, while we found your entire letter really interesting, one aspect really intrigues us, if you don’t mind telling us…Are your two children raising their children Jewish? There can be international soul mates. Otherwise, she married a poverty-stricken enlisted soldier without savings or prospects, 9 weeks her junior. But we made it work, scrimping and saving our pennies, thus far going on 42 years, God bless America! you might as well stay together! Well done! We do think that similar religious background is a biggie. As is sense of humor! As an aspiring writer, I love how both of you write. It leaves an indelible mark on me everytime I read your writings. Well, Dumisa, this is good for our egos even if highly exaggerated. Thank you. the truth is that unlike some writers we envy, we have to work quite hard on each piece we write. We heavily edit and re-edit and only finally publish after we’re both happy with it. So good to know you appreciate it. In many marriages in the past I see it was not uncommon for a large age gap and always the girl being younger….and they seemed to work out well, but until the last 50 years I think most marriages were Expected to work out well ! I am 7 years older than my husband, and we have not had problems with it , luckily, he LOOKS a lot older ,ha ha , and I was able to have babies at 37 and 39 ( something no one should plan on ) . The only “problem” of the age difference has been in that he was born in the thick of feminism . I was raised at the beginning of the feminist movement of the 60’s and so I saw the difference it made in home and family and completely rejected it by the time I was 30. Maybe the only feminist thing I clung to was the idea that I could completely rework my husbands belief in feminism !!! It is interesting that social movements can change so rapidly and just carry people’s beliefs along for the ride. 10 or 20 years can make a big difference in ideas. That is a very funny comment, Karen, with a great deal of truth. It was rather a question based off of a past experience that came to an end. The age gap wasn’t the reason it ended, but I had allot of comments from people concerning the age specifically and I wondered if I should stay away from an age gap in the future. You confirmed allot of what I know to be true and much more. I enjoy reading yours and Susan’s posts very much. Thank you for spreading the wisdom and knowledge that God has bestowed you with. I watched Israel’s 70th at Glen Beck studios online and enjoyed it very much. It’s lovely to hear back from you; thanks so much. We had a sense that you might have trod this path before. Thank you for your kind and encouraging words. Yes, that event that Glenn and HaYovel put on in Dallas last Thursday night was lovely and I enjoyed speaking for them.